PURINA Proplan Veterinary Diets Feline DM St/Ox Diabetes Management provides all the nutrition your diabetic cat needs for a healthy life. Diabetes affects cats in the same way it affects humans, and once it's been spotted is fairly easy to treat. This means your cat can enjoy a happy, active life just like any other moggy, and this food has been specially designed to give your diabetic puss all the goodness they need. It's important to spot diabetes early. If your cat is losing weight, or eating and drinking a lot more than normal, as well as being generally lazy, then these could be symptoms of diabetes. Make sure to get them checked by your vet as soon as possible. If your cat is diabetic, then they'll need a carefully balanced diet in order to get the most out of their food. 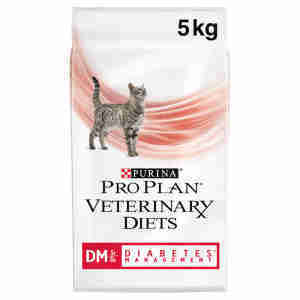 This PURINA Proplan Veterinary Diets Feline DM St/Ox Diabetes Management makes sure that your feline friend stays healthy thanks to a careful mix of low carbohydrates and added vitamins. Carbohydrates can cause blood sugar to rise, so lower amounts in your pet's food help to regulate it. Free radicals, which are formed as a result of diabetes, can also lead to illnesses including cancer. This food is packed with antioxidants, which destroy free radicals. The low carbohydrate content also helps to keep your cat at a healthy weight, and can help them produce more insulin naturally too. Dry Ingredients: Dehydrated Poultry Protein, Maize Gluten Meal, Soya Protein Isolate, Maize Starch*, Animal Fat, Soya Meal*, Digest, Minerals, Yeast, Fish Oil, *Carbohydrate sources. Nutrition: Analytical Constituents Protein: 50.0 %, Fat content: 17.0 %,Crude ash: 8.0 %, Crude fibres: 1.5 %, Starch: 12.5 %, Total sugar: 0.8 %, Essential fatty acids: 2.0 %,Additives: Nutritional Additives IU/kg: Vit A: 30 000, Vit D3: 1 000, Vit E: 650, mg/kg: mg/kg: Taurine: 500, Fe(E1): 225, I(E2): 2.9, Cu(E4): 45, Mn(E5): 94, Zn(E6): 380, Se(E8): 0.26. Wet Ingredients: Meat and Animal Derivatives, Fish and Fish Derivatives, Derivatives of Vegetable Origin, Minerals, Carbohydrate Source: Corn Starch. Nutrition: Analytical Constituents, Moisture: 76.5%, Protein: 13.0%, Fat content: 5.5%, Crude ash: 2.2%, Crude fibres: 0.9%, Starch: 0.4%, Total sugar: <0.5%, Taurine: 1 350 mg/kg, Energy value: 0.99 kcal/g, Additives: Nutritional Additives IU/kg: Vit A: 1 200, Vit D3: 160, Vit E: 180, mg/kg: E1: 34.4, E2: 0.66, E4: 4.2, E5: 6.1, E6: 83.8, E8: 0.05. *Daily feeding guide: see table. The recommended period of use is initially up to 6 months. It is recommended that a veterinarian's opinion be sought before use or before extending the period of use. Water should always be available. The veterinary diets should be used under veterinary supervision. My diabetic cat enjoys these dry food biscuits. I feel that he needs the high protein nutrition, a good product. Bought because cat is diabetic, however eats these just like normal cat biscuits. Price is very competitive and delivery times are very good. My cat enjoys this food, the pieces are just the right size for him.